This badge was issued to Veronica Gentili on 10 Sep 2016. Blueprint Certification is Facebook's credentialing program for digital advertising professionals who demonstrate advanced proficiency in Facebook marketing. 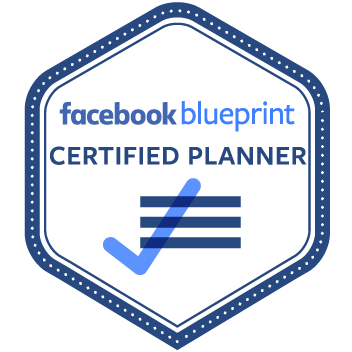 The Facebook Certified Planning Professional credential is awarded to digital advertising professionals who are proficient in planning successful Facebook advertising campaigns. 310-101: Facebook Advertising Core Competencies. This exam measures competency in the skills, tools, advertising policies and best practices required to manage Facebook pages, create, purchase and manage ads, select and utilize advertising objectives, target audiences for maximum impact, and understand the role of Facebook media planners and buyers. 322-101: Facebook Certified Planning Professional. This exam measures advanced-level competency in managing Pages, selecting and utilizing advertising objectives, targeting audiences for maximum impact, utilizing Audience Insights, optimizing reach and frequency, implementing planning strategy and best practices, understanding and learning from measurement solutions, and expertly tying Facebook products into a successful marketing and communication strategy. Maintain certification on an annual basis by completing activities that qualify for recertification, such as retaking the current version of the Facebook Certified Planning Professional exam.